Sign up now to see prices in your local store. 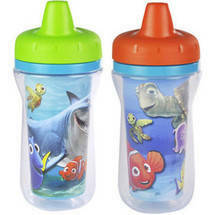 The First Years Disney Finding Nemo Insulated Sippy Cups:,Double-layer insulation,Easy-to-clean, one-piece lid,Fun graphics,Easy-to-hold, sweat-proof surface,Spill proof and leak proof,Dishwasher safe (top rack),BPA free,The First Years Disney Finding Nemo Insulated Sippy Cups feature double-layer insulation to keep liquids cold for longer and an easy-to-clean, one-piece lid. Kids love the colorful and bright artwork of the cup, and parents love the innovative design. The double layer makes the cup sweat-proof so that kids can easily grip the cup. And to make life even easier, all The First Years Insulated Cups have interchangeable lids. This means you can keep the cup even when your child has grown out of a sippy cup spout.